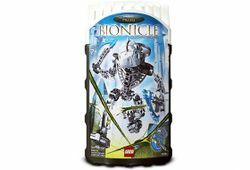 8741 Toa Hordika Nuju is a BIONICLE set released in 2005. It is one of the six Toa Hordika sets. Besides Nuju, it comes with a Rhotuka Spinner and Launcher and two Hordika Teeth. On the back is a Kanoka Code that when combined with the code on Nuju's Spinner, gives a user on LEGO.com Kanoka Points. In the BIONICLE universe, he was a Toa of Ice. This is a description taken from LEGO.com. Please do not modify it. (see an archive of the product's page) Ice Cold Power! Cold reason struggles with the wild anger of a Rahi inside Toa Hordika Nuju! He uses his Hordika teeth tools and Rhotuka frost spinner to battle the foes of the Toa, while seeking a cure to turn himself back into a Toa Metru. New feature! Pull the ripcord to send the Rhotuka spinner flying! Includes instructions to build a Rahi sea spider with #8741 and #8737! Facts about "8741 Toa Hordika Nuju"